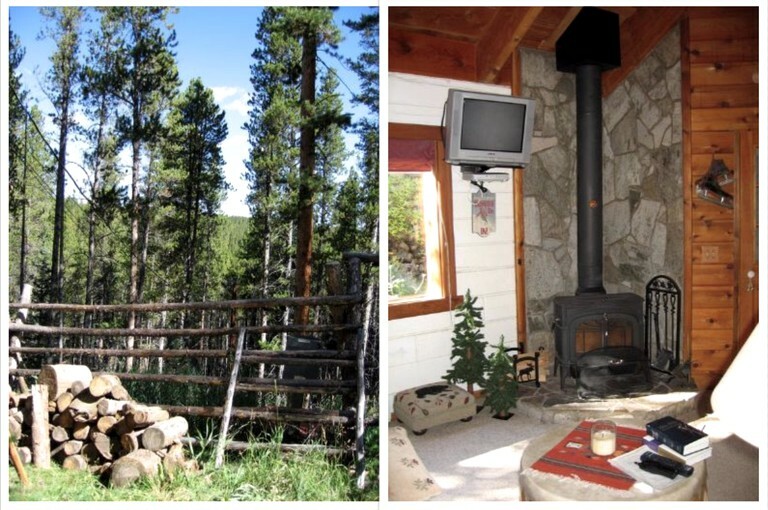 This secluded cabin rental is located in Breckenridge, Colorado and can accommodate eight guests. There are three bedrooms and two full bathrooms. The first bedroom has a king-sized bed with a beautifully crafted wooden frame, wooden drawers and two nightstands with lamps. This bedroom is bright and inviting. 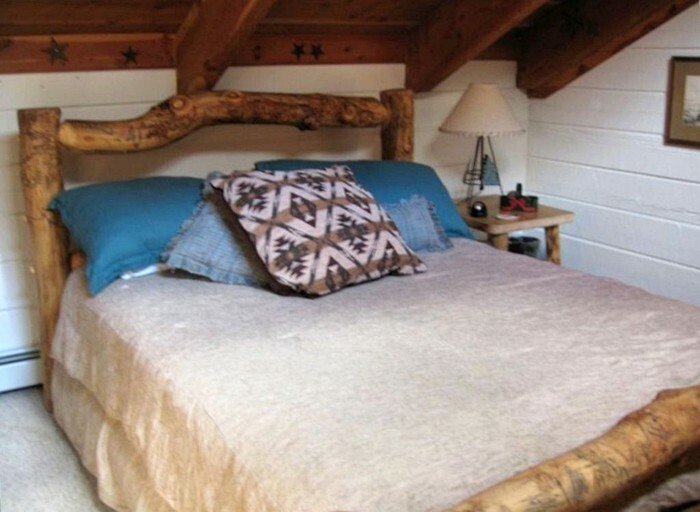 The second bedroom has a comfortable queen-sized bed, a TV, and a nightstand with a lamp. 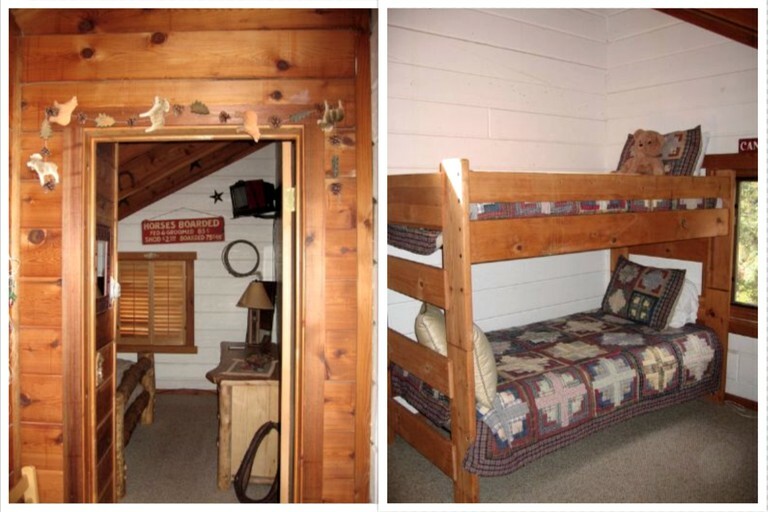 The third bedroom has two twin beds and bunk beds that can sleep an additional four guests. In the first bathroom, which is attached to the first bedroom, guests will find a toilet, two sinks, and a combination bathtub and shower. 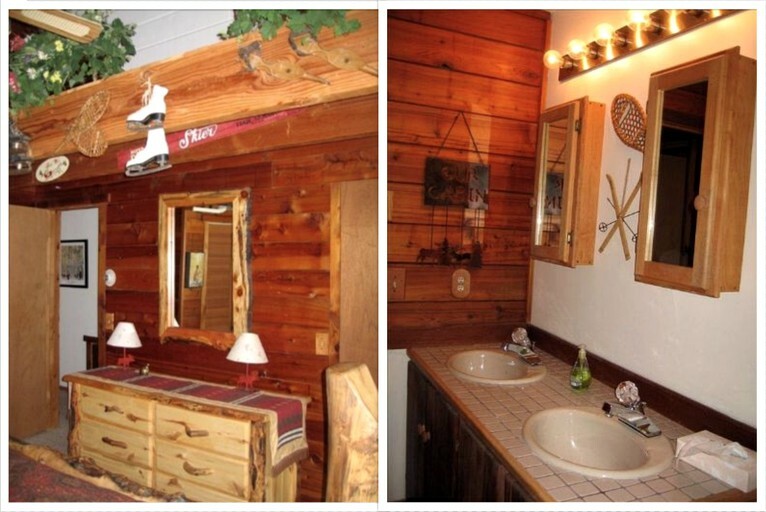 In the second bathroom, guests will find a toilet, a sink, and a combination bathtub and shower. This bathroom is located in the hall between the upstairs bedrooms. Linens and towels are provided. In the living room, guests will find two sofas, a television, a coffee table, and a wood burning fireplace. There is also a dining area with a charming wooden dining table that seats six people. 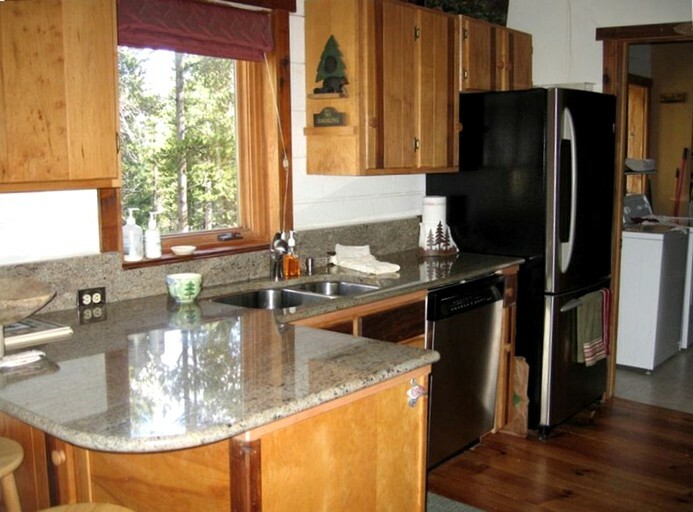 The fully-equipped kitchen comes with a stove, a refrigerator, an oven, a dishwasher, and a microwave. 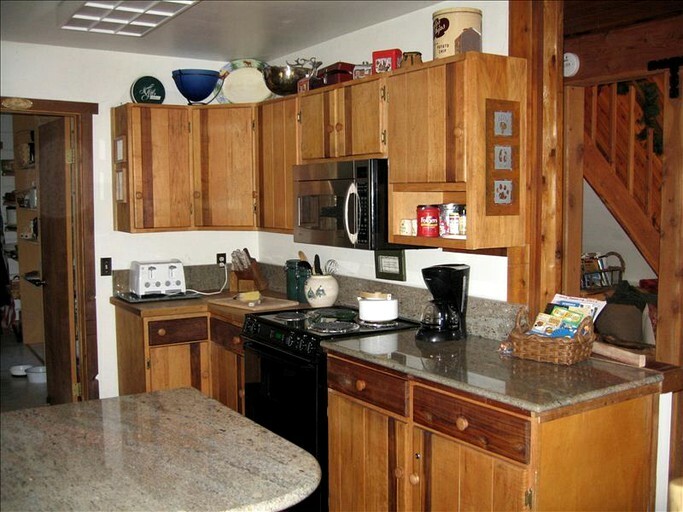 There is also a coffeemaker and toaster, an ice maker, and dishes and cooking utensils. 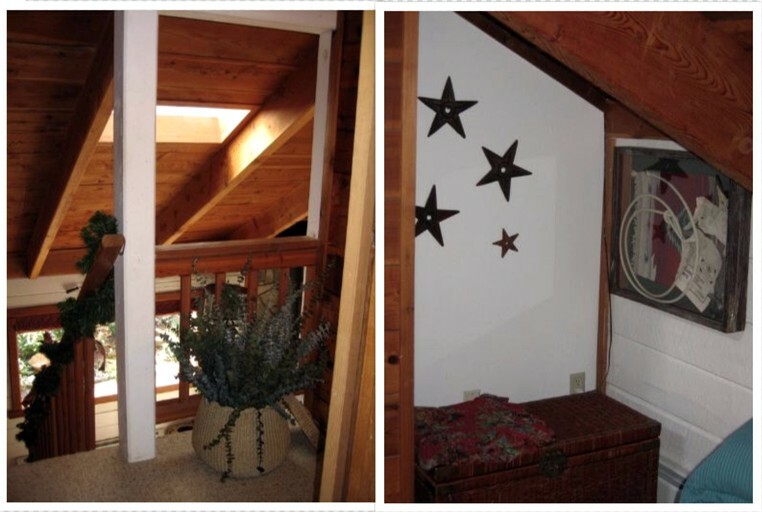 The open plan design of the downstairs areas of the cabin is ideal for socializing. Other amenities include Wi-Fi, a washer and a dryer, and a telephone. The accommodation comes with Wi-Fi and telephone, so guests can stay connected even in this secluded paradise. 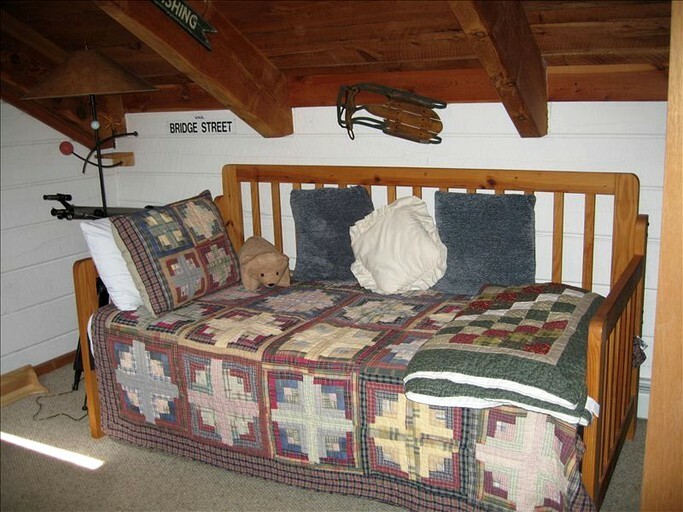 There is heating and a wood burning fireplace so that glampers can keep warm and cozy in the colder months. The property also has a washer and a dryer provided along with cable TV, a DVD player, and a stereo with outdoor speakers so glampers can relax to their favorite tunes out on the deck. Also on the deck guests will find a hot tub and an outdoor grill, everything needed for an incredible outdoor living experience. 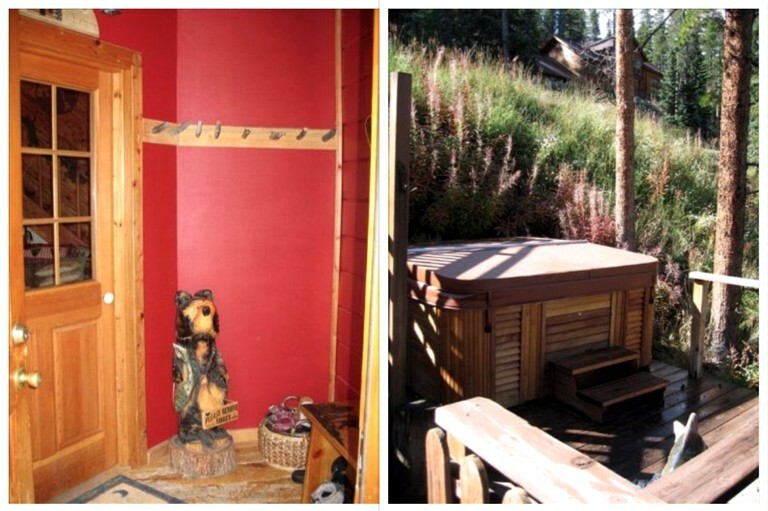 There are skis and a snowboard at the accommodation for the guests to use if they wish to explore the nearby ski resort. 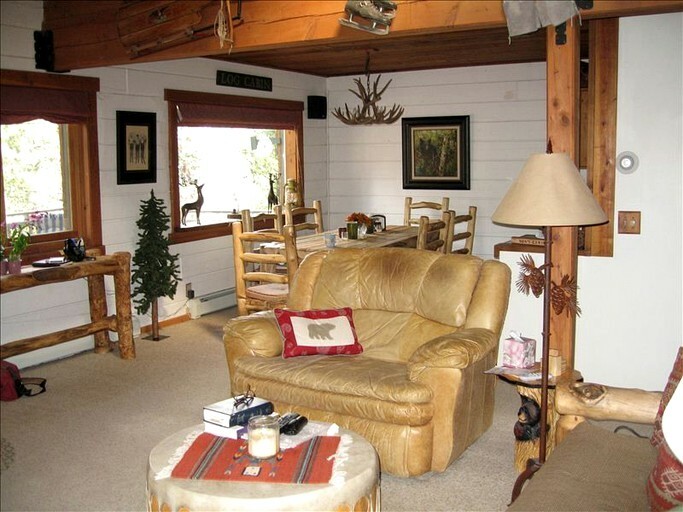 There is off street parking available at the property so glampers can bring their cars and discover the sights of downtown Breckenbridge a few miles away and travel around Colorado taking in all the natural beauty. 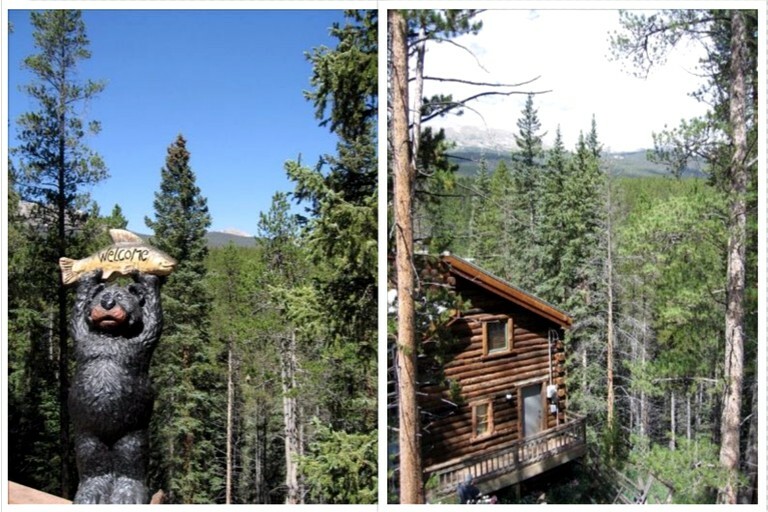 This timeless property is located in Breckenridge, Colorado and is surrounded by stunning forest, hidden away in a spectacular mountain setting. 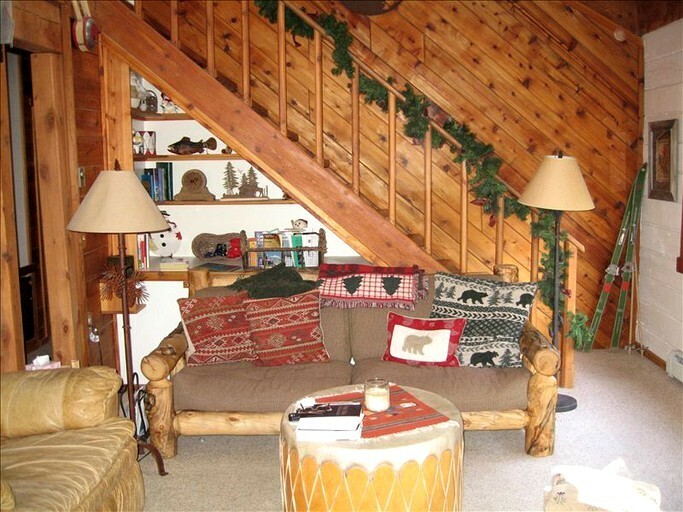 The accommodation is a few miles away from downtown Breckenridge where glampers can enjoy skiing and snowboarding and where they can sample the cuisine of the superb local restaurants, indulge in plenty of shopping, and witness the thriving nightlife. 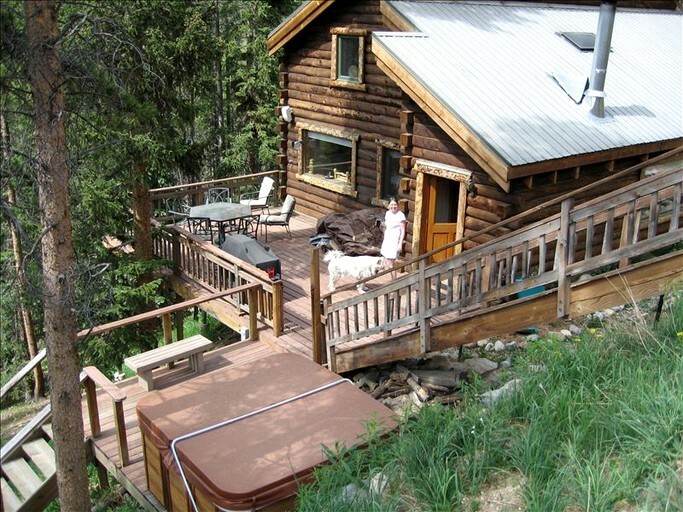 At the rental, guests will find their ultimate mountain getaway where they can enjoy sitting and star gazing on the deck or soak and relax in the luxurious hot tub. The Colorado town is known for its ski resort and year-round activities, as well as an intriguing Gold Rush history. 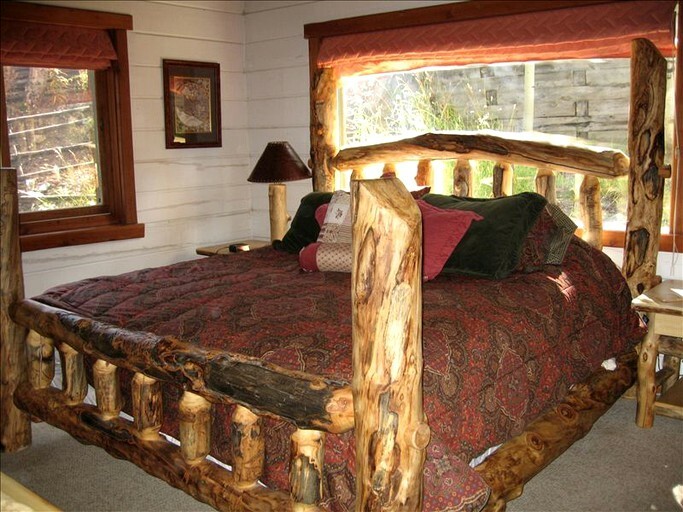 The location is a two-hour drive away from the Rocky Mountain National Park with its abundance of protected mountains, forests, and alpine tundra. Glampers can also drive an hour and a half to explore the city of Denver and visit the Denver Art Museum, the Denver Museum of Nature and Science and the Botanic Gardens. 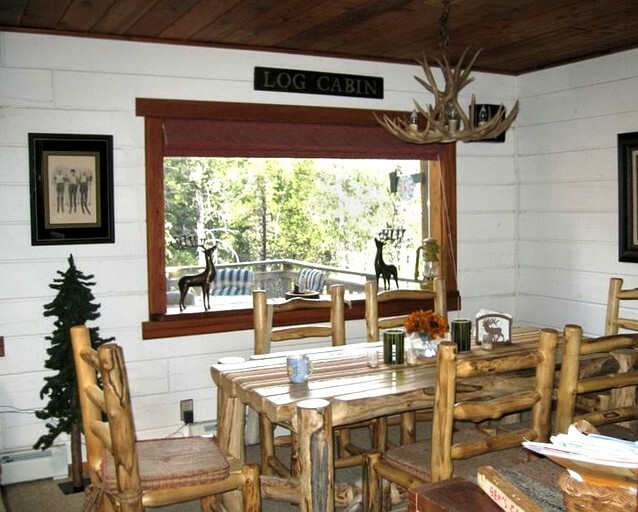 Active and adventurous glampers can relish in the numerous hiking and mountain bike trails surrounding the property. 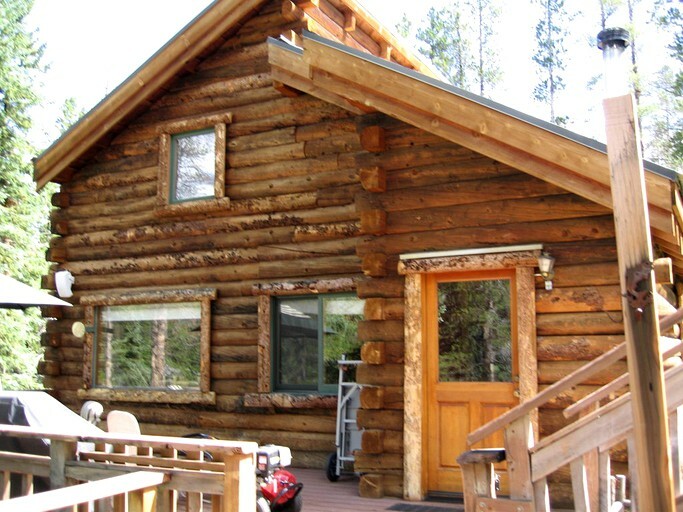 Guests can head to Lake Dillon and go sailing with the variety of boat rentals on offer there. There is plenty of opportunity for wildlife viewing in this county so keen photographers shouldn´t forget their cameras and nature lovers may also like to have a go at horseback riding. Thrill-seeking glampers will be more than happy with the nearby ski resort where they can enjoy skiing, snowboarding, and snowmobiling. Exhilarating rock climbing, whitewater rafting, and kayaking can also be taken advantage of in this part of the world. Guests with a competitive spirit can also enjoy tennis, racquetball, and basketball. Those that prefer to unwind with relaxing activities can take a hot air balloon ride, play golf, or try a spot of fishing. Hunting and fly fishing also attracts interest in this part of Colorado. Glampers can take scenic drives back to civilization and partake in the sightseeing, antiquing and outlet shopping, and the local bustling nightlife and afterward return to their secluded paradise in the woods to relax and unwind. 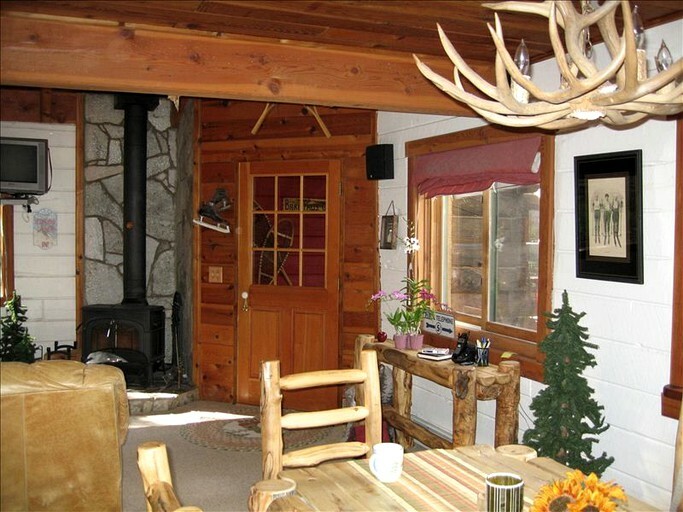 Pets are allowed at this property and the cabin is family-friendly. This accommodation is non-smoking. Rates may vary depending on the season.